10 reasons you must visit Mauritius!! Mauritius is pretty well known for its dolphin cruise, which will starts pretty early in the morning, just a little before sunrise. 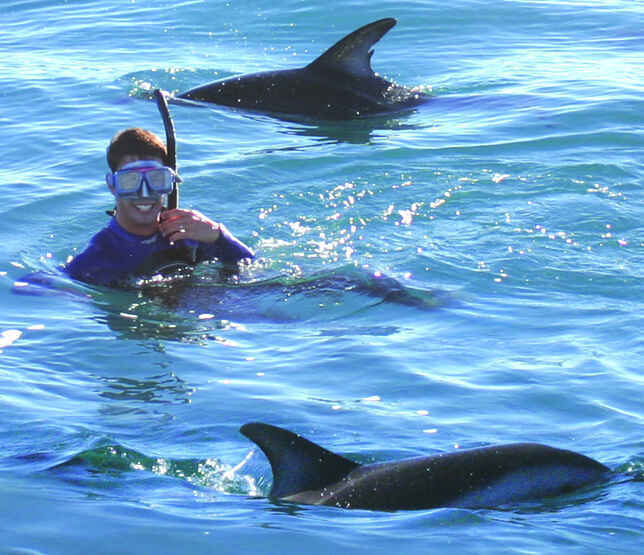 Do take the opportunity to get one one of these cruises where you will be taken to the open sea to see these beautiful sea mammals and perhaps even enjoy a refreshing swim with these magnificent creatures. Flic en Fac and Tamarin Bay are the said to be the best beaches for this activity. Chamarel is a very unique little village in Mauritius because of it’s seven coloured layers of sand. There will be tourists there everyday at the observation deck and marveling at the amazing colour hued sand, ranging from yellow, red, brown, violet, purple, green and even blue. You can even buy the seven coloured sands of Chamarel which will come in a tube as a souvenir to bring home. Don’t forget to stop by the Chamarel Waterfalls for some great photos as well. 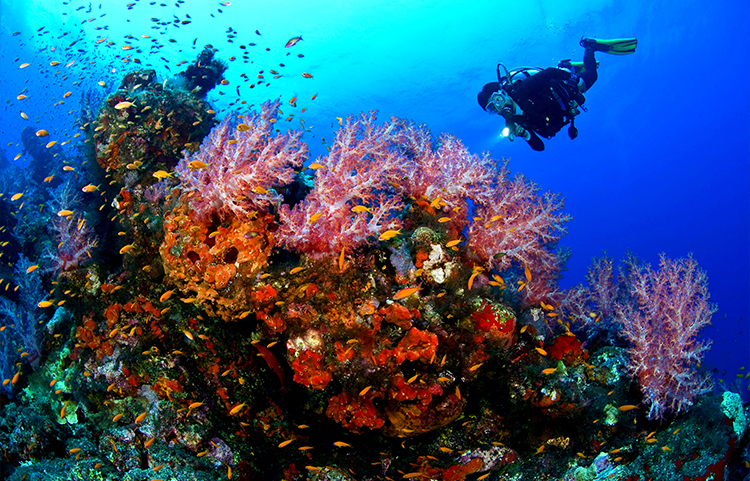 The island of Mauritius offers an amazing diving experience. When you dive here, you enter the world of bright corals, multi-coloured marine life, and ship wrecks dating back to the 18th and 19th Century. If you are not a certified diver you can either get your certification here or opt for one of the uncomplicated dive sites. Of course, there are some sites only accessible to the advanced divers. Mauritius offers a lot of options for those who want to sail the sea. Choose from one of the speed boat tours, catamaran tours or hop onto a traditional boat to spend a romantic day island-hopping. For the brave and for animal lovers. Try taking a stroll with a lion or two. I know I would love to do this, and I think I surely would (after all I have played with a baby panther and petted tigers in Thailand, too) . This is an adventurous activity for those who wish to experience the wild side. Don’t miss this unique opportunity which will be the highlight of your holiday in Mauritius! This activity takes place on the banks of Riviere du Rempart in a separate area of the Safari park. The dodo bird is quite well known for its whimsical appearance and character, but mostly for the fact that it is already extinct. Strangely, the history and legacy of the dodo are quite important and treasured by the inhabitants of the island because the dodo called Mauritius its home when it was still around. In fact, there was nowhere else the dodo could go, being a completely ﬂightless bird. 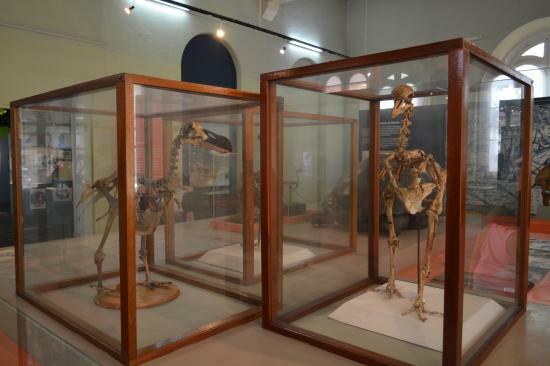 This charming history can be explored at the Natural History Museum in Port Louis, where travelers marvel at the bird’s reconstructed skeleton. Nature lovers will definitely fall in love with the nature reserves and botanical gardens in Mauritius. There is just so much to explore, plus mountainous vistas, waterfalls and tropical forests. Created in 1750 and considered the oldest botanical garden in the Southern hemisphere, the Ser Seewoosaigur Ramgoolam Botanical Gardens in Pamplemousses has a whopping 500 species of plants, including giant water lilies and over 80 varieties of palms. On Île aux Aigrettes, off the southeast coast of Mauritius, do keep an eye out for endemic species like Mauritius kestrels and pink pigeons, as well as Aldabra giant tortoises. The UNESCO World Heritage site of Le Morne Cultural Landscape is an impressive mountain that juts out into the ocean; its peninsula sheltered runaway slaves in the 18th and 19th centuries. Mauritius is the top sport ﬁshing destination in the world. The picturesque waters are already so very pleasing to everyone, more even to the ﬁsherman, because in these same waters are home to several varieties of shark and tuna. Although these ﬁsh are not what the hobby ﬁsherman might intend for a relaxing afternoon at sea, the sport ﬁsherman jumps at the chance to encounter these beautiful and challenging creatures. 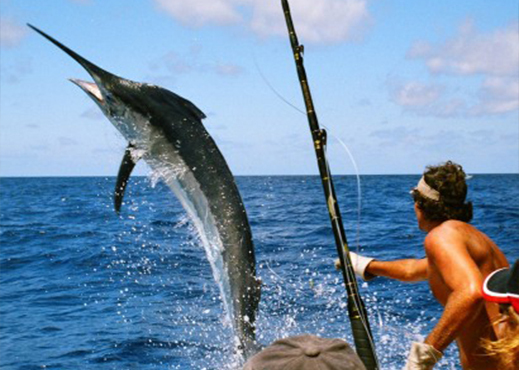 The Marlin World Cup is held in Mauritius every year, and catching a half ton marlin is just another day at sea. When there is a diverse ethnic mix, great cuisine follows. Discover amazing cuisings such as the vindaye poisson (fish vindaloo), rougaille saucisses (wild boar sausages in a spicy tomato sauce), chicken kalya (poultry cooked with yogurt and spiced with saffron), smoked marlin and palm heart salad. The capital, Port Louis, is a great place to taste gajaks (street snacks) such as daal puri (flatbread with split peas), samosas or gateaux piments (chilli bites). How about some swordfish steak? Head to the beach where the pirogue fishing boats come in and pick the choice of the catch for dinner. You can even take part and learn some Mauritian cooking. Mauritius is also famous for its rum and has more than seven distilleries on the island for non Muslims… of course..
Mauritius has quite a liberal approach to tourist visas. Most foreign nationals (including the US and Canada) don’t need visas and well, this includes Malaysians.. Malaysians are entitled to a 30-day stay without visa. Easy peasy!! 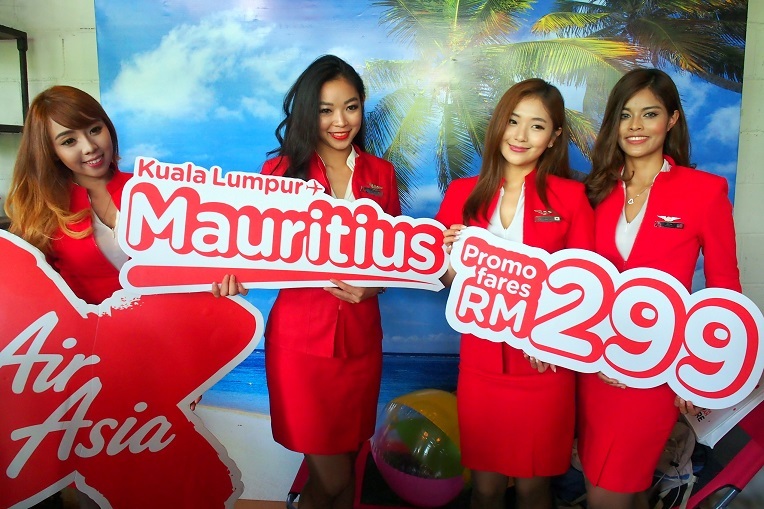 Great news…AirAsia X just announced that it will connect to Mauritius directly from Kuala Lumpur, with three times weekly flights commencing 4 October 2016*. This brand new destination will be operated on the Airbus A330-300 with a capacity of 377 seats, inclusive of 12 award-winning Premium Flatbeds, and marks the AirAsia X Group’s 22nd destination throughout its route network. 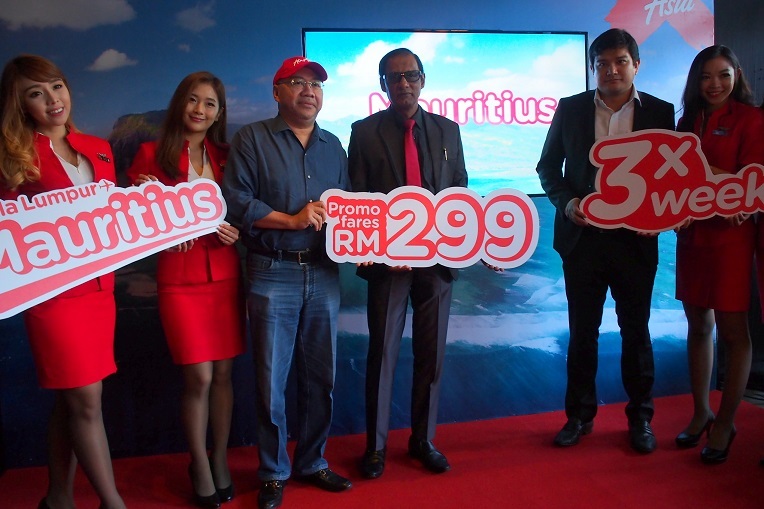 Introductory all-in-fares from as low as RM299** one-way on standard seats and from RM999** one-way for the Premium Flatbeds were also launched during the event, these promotional fares are available for booking from 26 May to 5 June 2016, so what the hell are you waiting for? (Pardon my language, hahah) Get online now and start booking!!! These promotional fares will be available online at airasia.com as well as AirAsia’s mobile app on iPhone and Android devices, and the mobile site mobile.airasia.com. The travel period for this promotion will be from 4 October 2016* until 22 May 2017. Mauritius is the perfect stepping stone for those Malaysians who wanted to go beyond and explore the beauty of Africa – from beautiful Cape Town to the exotic lands of Namibia, Madagascar and Botswana. Mauritius was once a volcanic island and is famous for its beautiful beach setting with white sand, warm sub-tropical climate and a topaz shoreline of the Indian Ocean. Guests can choose to relax on the longest beach in Mauritius at Belle Mare Beach sipping fresh sugarcane juice, or experience scuba diving, as the island is known for its excellent underwater visibility and warm temperatures that attract an abundance of marine life. If you are feeling a little adventurous, embark on an Underwater Walk around the ocean bed in an oxygen helmet and mingle with the fishes. For more culture and history, head to the capital of Mauritius, Port Louis which boasts a plethora of colonial monuments or follow the pilgrimage route to Grand Bassin, whereby the second largest statue of Lord Shiva in the world is standing at the entrance to the natural crater lake on the mountains. Glad to find that now AA flies to Mauritius. Definitely worth visiting! Wow…I was very impressed by the rainbow sand, this was my first time know about rainbow sand. That rainbow sand really attract me. Now that we got alternative and cheap flight to Mauritius, this is a must visit then! I hope that I can be able travel to Mauritius! Island for all the beautiful Dolphins =D One day I will soon visit this Island with my friends! Thanks for sharing Miera!!!! I hope i can travel there!!! The view is so so so beautiful!!! don;t play play.. go so nice place. I am wishing upon a star for my chance. Looking at your photos, I feel like travelling now to Mauritius now and true we dont need any reason as place is so beautiful. Indeed, I agree with your reasons! Mauritius is a such a beauty. So many extraordinary places! Thanks! I’ve also written something worth reading about the Chamarel in Mauritius. Do read about it and let me know your feedback.